These old candle jars were fished out of my craft supply. I really can't tell you how long they've been stashed away for a project of unknown vision. One jar is from Yankee Candle Company and the other one is some mysterious store brand bought somewhere at some point in time. 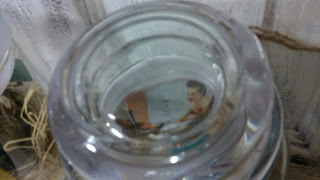 After the candles burned down, I just couldn't toss out such lovely jars with lids. Cleaning the jars is a simple process. I DO NOT recommend microwaving the jars to melt the wax, the end of the wick is secured with a metal tab. Instead, using an old pot, I set the jar in boiling water. Using an oven mitt I carefully poured out the melted wax into a tin can, saving it for later for who-knows-what (you know you're a hoarder when...). After the jar cooled, I sprayed it with rubbing alcohol and wiped clean with a rag. I went with a spring themed creation. Didn't realize until I enlarged this photo that it looks like a bird mug shot. 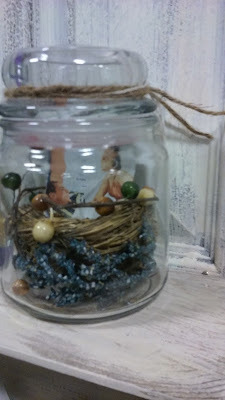 When seen from an angle, this is an adorable bird-in-a-jar. 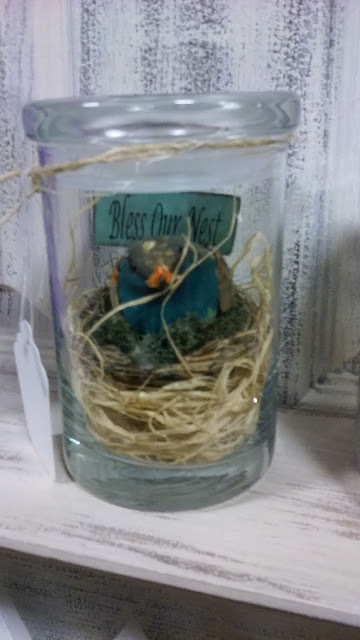 I didn't set out to create an empty nest spring display, it was supposed to include a bird, but my two year old bit its beak off. He's not a vicious child, just a hungry one evidently. He also chewed on the faux bird eggs set aside for another nest project and that I could understand, they did look like candy. He must have been disappointed when he bit into those! No chocolate insides there. Maybe I should keep snacks in my craft room so he stops nibbling my supplies. Tried for a top shot...just wasn't working. IRL (in real life) it is much easier to read the picture. On a side note: I just learned what this "text speak" meant, IRL, and I'm sure tweens everywhere would roll their eyes at that confession. They can't imagine a world where everyone spells out WHOLE words when three letters will do. Spelling is only for old people, you know, like the empty nesters, or the on-the-verge-of-middle-age women who are trying to arrange a teenage babysitter via text. Anyways, here they are sitting on the middle shelf of my door/shelf. I really really wanted to use them in a Pinterest worthy vignette but people keep buying things (the nerve!) and it messes with the display (the rough life of a booth owner). While I didn't go all Pinterest crazy, its an aspiration this greenhorn will keep shooting for. Baby steps. I'm on the hunt for more candle jars with fitted glass lids. 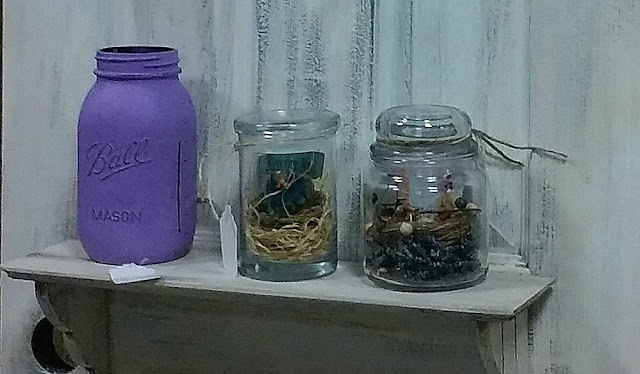 Good one, love seeing your door/shelf with the jars. Thanks Joy! 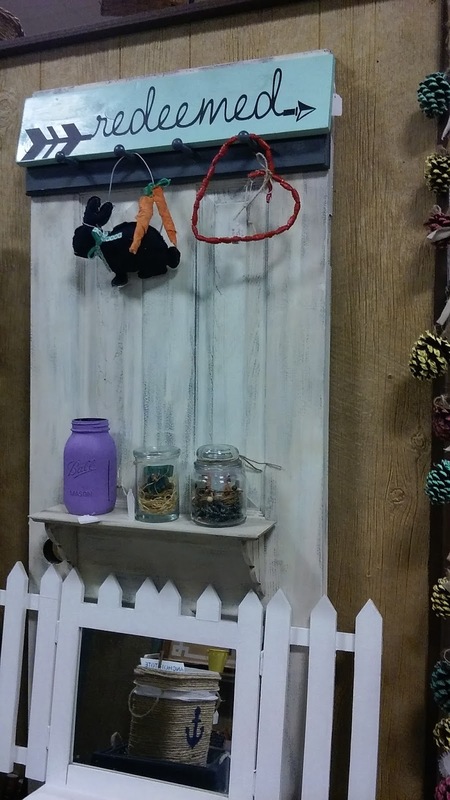 I'm loving the door/shelf and wish my house entry way was big enough to accommodate one, they are so handy. Adorable...and funny!! As a mom and former preschool, k and grade one teacher, I am quite familiar with bitten items. It made me laugh!